Yesterday I posted a Sneak Peek of PhotoView 360 and today I am posting a First Look of PhotoView 360. PhotoView 360 Beta is now available for download at the Customer Portal so the rest of the NDA has been lifted. I can now talk about all aspects of the program. I honestly didn’t think it would happen this quick so you get the First Look review today which will highlight some of the features of the software. I’ll post some more in-depth stuff in the coming days. I’m sure my buddy Rob Rodriguez will be posting some stuff on his Blog too. Ok…let’s jump right in! Below is a screen shot of the main User Interface (UI) window of PhotoView 360. As you can see the UI is VERY simple. The image you see above is the render preview image. This is a view of the model that you can rotate, pan, zoom, zoom fit, and box zoom. It is important to set your floor in SolidWorks as this is the floor setting that PhotoView takes. The nice thing about this is that it makes rotation of the model easy. There is no way you can get your model turned upside down. 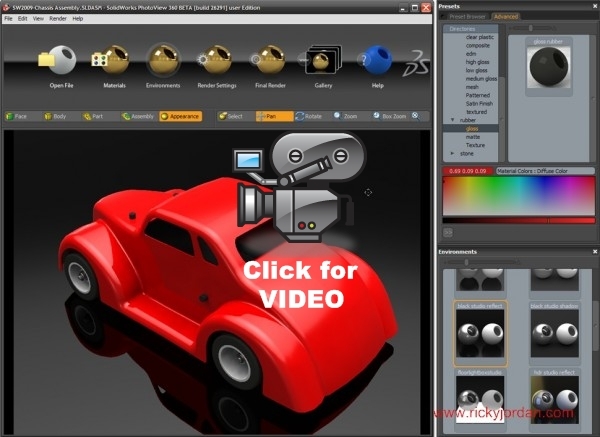 With PhotoView 360 you can apply Materials through a drag and drop interface. You also have several different Environments that can be loaded. Environments carry the background, floor, and lighting setups. Lets start with the Materials. When you click the Materials button shown above, a separate window containing the Material selections opens. The main UI window opens smaller than your full screen size. This is so that your preview window isn’t too large. The larger the preview window, the longer it takes to update. 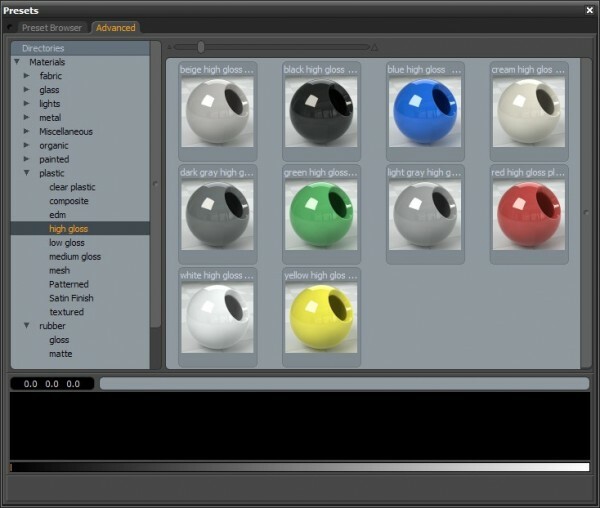 The Materials window is shown below. You might notice that the Material categories look similar to Appearances in SolidWorks. That’s because PhotoView is designed to import most of the Appearance data setup in SolidWorks. In order for this to happen consistently, you’ll need to save your files in the SolidWorks 2009 format. PhotoView will open files from previous versions, but will most likely have no Appearance/Material data. Some of the Materials DO have textures and you have the ability to make some adjustments to those textures. You have the ability to apply Materials to model Faces, Bodies, Parts, Assemblies, and Appearances in PhotoView 360. The Appearances part of this might throw you off a bit at first but I have found it to be very useful. When you setup Appearances in SolidWorks, your Appearances are applied in Groups. For instance, you may apply a single Appearance to many components in an Assembly. If you have done this, you can drag a Material over one of the components in that group with the Appearance mode selected and ALL of the components in that group will receive the Material in PhotoView. 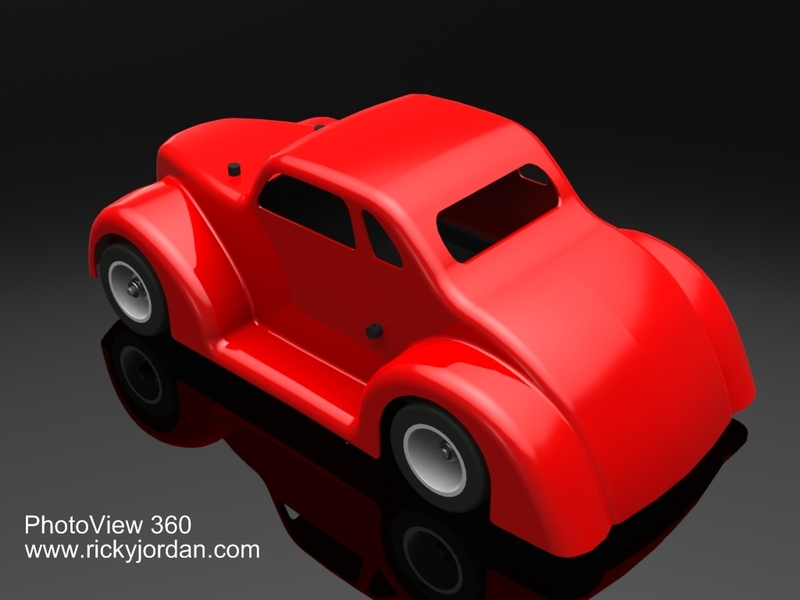 If you set your Appearances up right in SolidWorks, it can be a timesaver in PhotoView. When you click the Environments button in the main UI, a separate window opens in a similar manner as the Materials window. The Environments window is shown below. There are 15 default environments that come with the software. I have not gotten into the software enough yet to fully understand what changes can be made to these environments but it looks like the options may be somewhat limited. Double clicking an Environment box activates it for the model window. I have prepared two separate videos that show PhotoView 360 in action. 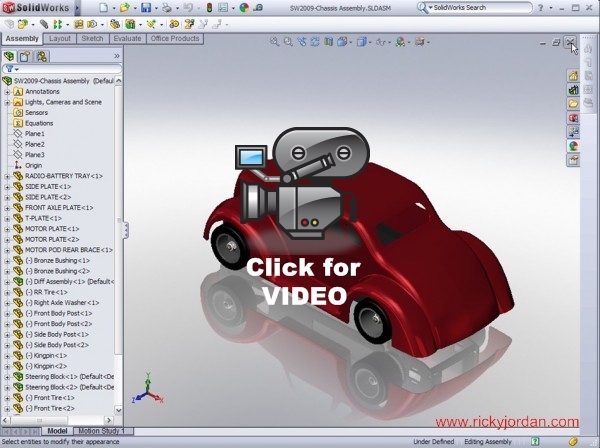 Click on the image below to view the first video which shows a model in SolidWorks followed by the quick setup in PhotoView 360. The second video shows the actual rendering of the model. I did this to show just how fast the rendering is in PhotoView 360. Notice the two boxes in the video. Since I have a dual core processor, PhotoView 360 is taking advantage of that and is using BOTH processors to generate the rendering. Click on the image below to view the second video. Below is the rendering produced in the second video. This looks great – thanks for the preview. I just installed it but it won’t run – says I don’t have a license. Where would I get that or how do I run it? I have SW2009 Beta 2 installed – if I install PR-1 – would that help? If you install PR-1, it should work. I’ll try to get clarification on what version of SolidWorks 2009 needs to be installed to run it. We installed both SolidWorks Pre-Release 1 and PhotoView 360 on another machine at work this morning and had no issues. Great videos! Thanks for putting them up! I saw in one of them you seem to be altering the color of the material. Do you have to start with a similar color or is it possible to replace colors or apply color in colorless materials like transparent plastic and such? I’d love to download and try both the PV360 and SW2009, but I can’t get it to start downloading at home, and our IT dept won’t give in to let us grab it here. Anybody have it in a form that can be burned and mailed?? Will PhotoView 360 come with SW Premium or it will any addiational cost for this new stuff ? The last word I heard was that PhotoView 360 will be included with SolidWorks Professional and above. Have you tried the manual download? Absolutely fantastic. I would guess that it will not work with version 2007 that I am still using. Or will it? Gabi, asked a question that I had in mind to ask after looking at the videos that you posted. Really great stuff. Thanks. I’m sorry..I forgot to respond to your comment! Things have been kinda hectic. Yes, there is a way to alter the material color. There are typically 3 color adjustments that can be made. 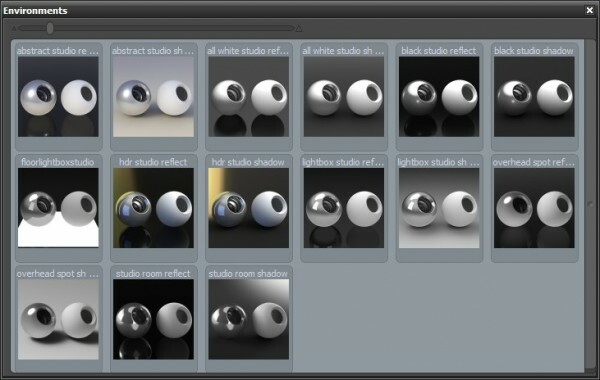 Diffuse Color, Specular Color, & Reflection Color. Depending on the material, Transparent Color, Subsurface Color, & Luminous Color are sometimes adjustable tool. The trick is to pick the “Select” option in the UI then left click a surface with the material applied. You can then adjust the colors from the Advanced tab in the Materials (Preset) window from there. I’ll try to develop some further posts that show this in more detail soon. 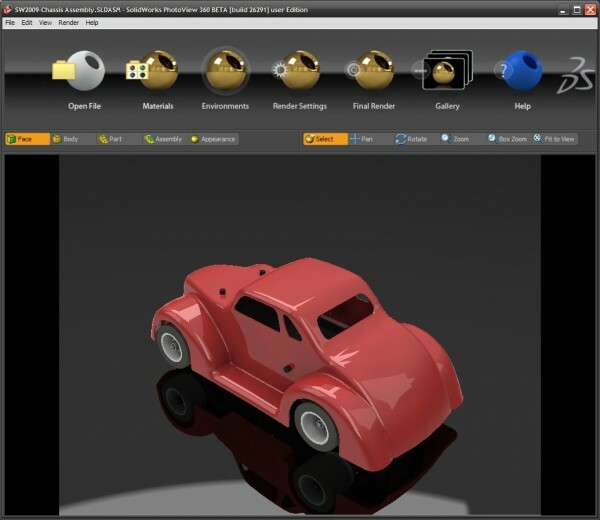 For licensing purposes you have to have SolidWorks 2009 Beta 2 or later installed on your computer to run PhotoView 360. Hopefully as we get closer to SP0 more details will come out on the packaging of this product. Also – Thanks for the compliments. I’m really glad to hear you found the article useful. SO we will get both of PhotoWorks & PhotoView 360, Isnt It ? I’m can’t get any 3d woods over from SolidWorks (2009 Pre-Release 1) to PhotoView 360. If PhotoView 360 won’t be offering 3D woods – the only type that look anything like realistic on e.g. any wooden parts with rounded corners or generally curved in shape – then we might end up with the situation where we wouldn’t know if we’ll get better results inside SolidWorks or exporting to PhotoView 360. For example, a table with both wooden and metal parts might end up with the metal better rendered and the wood worse rendered in PhotoView 360, or the wood better rendered but the metal worse rendered inside SolidWorks. Hopefully its a detail they’ll fix! Those 3d woods are essential for realism! It took me a few times reading your comment before I think I realized what you are talking about. I believe you are referring to the rear portion of the car behind the cab area where there is a visible line across the centerline of the body. This was done on purpose. Many cars have “witness lines” such as this and that was the intention here. Great eye to catch that! thank you .. it was nice……. I'm particularly interested in how the Appearance selection works in PhotoView. I watched Leuenberger 's video, but he didn't discuss the Appearance selection. You wrote: “When you setup Appearances in SolidWorks, your Appearances are applied in Groups. For instance, you may apply a single Appearance to many components in an Assembly.” How do you this in SolidWorks 2009? I am only able to apply Appearances to a singl assembly, part, feature, or face: I can't multi-select. If you could help me out, I'd really appreciate it (I'm assuming that you must use Solidworks to define the “Appearance Groups” that PhotoView uses; if you can create groups directly in PhotoView, even better). do you know how to rotote/ turn which way your grain direction comes into the model? Good job! How to rotate though? Keep it coming, we'll be waiting for your updates. I think I realized what you are talking about. I believe you are referring to the rear portion of the car behind the cab area where there is a visible line across the centerline of the body. This was done on purpose. is there any new material or enviroment for downloading? how can and where i download photoview 360, sir? Hey Ricky, great web page. Big help to me, I teach solid works in school. Only problem is I cant for the life of me get photoview or photoworks for solid works so I can’t get a realistic image. I have been to the link you recommended and created an account and still no luck. Is it available any place else or is there any way in which I I can get it in a zip or setup file? Will i have to buy it someplace?